I’ve been trying to write all day and I just can string my thoughts together in a way that makes sense outside of my own head. 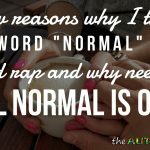 In the spirit of Autism Awareness month and in an attempt to help you better understand what at least this Autism Dad is struggling with, here’s what I’m feeling tonight. I’m finding myself in a dark place tonight. I’m feeling seriously demoralized and beaten down. I’m broken hearted for reasons that are too many to explain. I’m conflicted because I know tomorrow’s a new day but it seems far away. I’m doing the best I can but I can’t fix the many things in our lives that need fixed. I’m struggling the most with feeling like I’ve failed my family and that’s eating me alive. 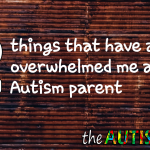 Being an Autism parent is a trial in many things. 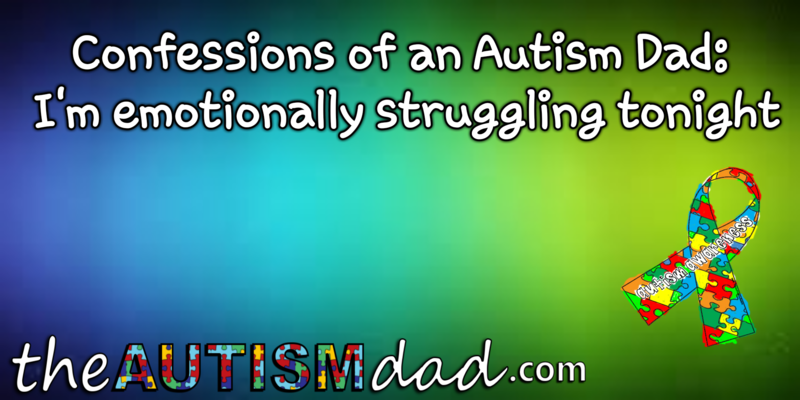 It may seem like our kids with Autism would be the most difficult of these trials but that’s not always true. 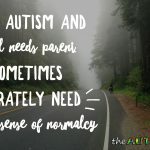 Sometimes the most difficult part of being an Autism parent is facing, as well as dealing with our own demons, our own emotions and our own limitations. I know that when I wake up, it will be a new day and a fresh start but that doesn’t make any of this easier for me to cope with at the moment. Sorry you are hitting the wall Rob. I know if I am nearing the end of the day and start feeling really depressed, I know I can hold on til tomorrow as my feelings may simply be due to exhaustion. 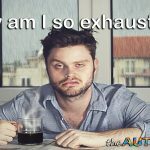 Much, much harder to wake up and struggle at the beginning of the day. I imagine that having to detox from the Paxil plus the ever-present lack of sleep you get are making your down feelings much worse. We all face challenges and sometimes we all feel like we are being crushed by them. 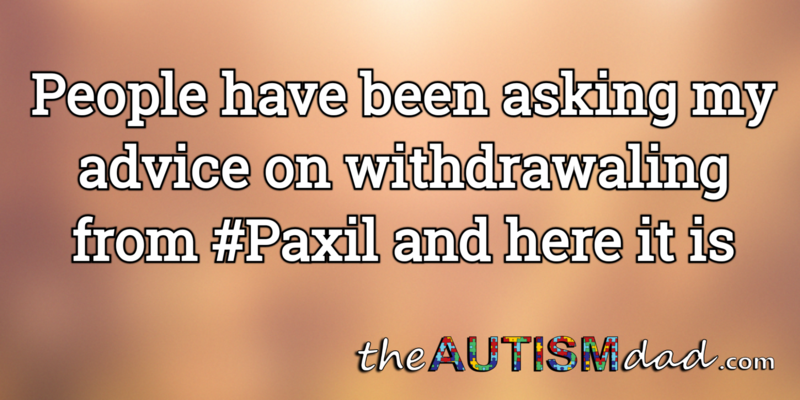 The Paxil thing is an ongoing nightmare and you’re probably correct in suggesting it’s impacting me. Jimmy pointed me to this link today and I’m so grateful he did. Glad you read the article. 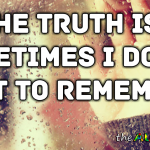 Seemed to hit on a lot of the things you’ve been experiencing yourself. As for Dutch’s comment, I get where he’s coming from. I think he reads your blog, to a large extent, to be “entertained,” and he finds your posts about being overwhelmed to be boring. And there’s nothing wrong with that. Could your blog be more focused, with every single post having a larger meaning and having greater interest to an even larger audience? Sure, but that’s not you, that’s not your life, and that’s not this blog. 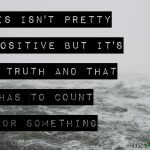 Sometimes you just need to vent, and if this blog serves that purpose for you, then great, and if there’s people out there that like to say “I feel that way too” when you’re venting, then good for all of you. I get what Dutch is saying though, and if you look at what he’s saying not as a critique of your post, but merely as a suggestion, just take it for what it’s worth, and move on. I think some posts of yours do exactly what he was suggesting, but that just wasn’t what this post was about. I hope you find yourself in a better place soon. Thank you Jimmy. Here’s the problem. For starters, you might be giving Dutch too much credit. There’s a long pattern of comments coming from him that always criticize or attempt to critique what I write. I no longer give him the benefit of the doubt anymore. There’s a time and a place for everything. If I were to read a post like this on someone’s blog, my heart would immediately go out to them. I would try to show support and compassion. I wouldn’t even think to critique what they said or how they said it. Who am I to do that? It’s their blog. It’s their life and who am I to interject my opinion when they weren’t asking for it. That’s my problem. I don’t write this stuff to be a form of entertainment. I’m never going to be totally uplifting all the time. This is real life and some people just seem to lack the ability to know when to say something and when not to. In fairness, I shouldn’t get upset because traffic is traffic but I’m not in a good place right now and haven’t been since I started on this Paxil thing. On a good day, most people wouldn’t survive my life. 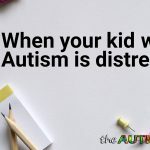 On a good day, most people wouldn’t survive stepping into the shoes of any Autism or special needs parent, especially those who are quick to judge. That doesn’t mean that others aren’t going through things or that I could walk a mile in their shoes either. I just get frustrated when the same people, approach this blog in the same way. It never changes and I’m simply no longer going to reply to comments like his. Frankly, I don’t get how anyone who knows their comments aren’t appreciated or even welcomed at times, would continue to put them out there. There are no words to fix how you’re feeling, but I think it’s great you can use this forum to get the thoughts off your chest a bit. I hope you can get a break soon and take care of yourself to feel better. Take care. 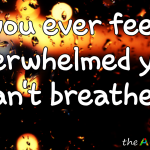 It might be helpful (for not only the readers, but for you) if instead of repeatedly writing how overwhelmed you are, that you started writing about what you are doing to get over some of the things that are overwhelming. Not what you plan to do, but what you ARE doing. I know I find it helpful to see what I have done instead of looking at everything I need to do. Dutch, it is actually useful for Rob to just state his feelings. Because then people can relate to what Rob is going through. I know I’ve had dark times and knowing I’m not alone can help. Now, if my reading of psychology is correct, men tend to be the ones who instantly want to formulate a PLAN to fix a problem or problems. Whereas women tend to want to vent to relieve their stress and have others listen with empathy. Now, Rob isn’t a woman but as a woman I’ve had dark times and knowing I’m not alone can help. So Rob’s post is helpful. And Rob does talk about strategies of dealing with his and his family’s issues, just not necessarily while venting. Finally, this is his blog so I figure he gets to say anything he wants the way he wants. But I wanted you to know that Rob’s venting isn’t useless to other people. I offered a suggestion that is literally proven to help. I forgot that was frowned upon here. Dutch, move on. This is not a blog that benefits from your approach. You don’t get it and that’s okay. Either except that what I’m doing helps those I’m trying to help, even if it doesn’t do anything for you or just keep your comments to yourself. Hi Rob. I’m sorry you’re not doing well these days. I have to say that I get where Dutch is coming from. You want to help educate the masses about life with autism/autistic kids and about living with depression and you have a forum to do that. 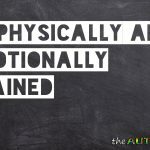 I don’t have autistic children but I have learned a thing or two from this blog, whether it was from you or someone who commented. While I might not be your target audience, I AM a taxpayer and a voter, so educating people like me and Dutch can only work to your advantage when it comes to voting in lawmakers who might be ‘on your side’, so to speak. Maybe I’ve missed the mark, but can educating more people ever be a bad thing? Thanks Kim. Not sure why you being a taxpayer has anything to do with anything. I get what you’re saying but Dutch never has anything positive to say. It’s always critical and it’s a waste of my limited time and energy to engage with him any further. You and I don’t always agree and that’s not likely to change. However, you contribute really positive things here and I don’t mind answering your questions because you don’t assume that you know more about my situation than I do. The times we don’t agree and are still able to agree to do so. Dutch always comes across the same way. Always critical and I can’t remember ever reading anything remotely resembling compassion. When I wrote this post, I was literally sobbing because I was in that dark of a place. 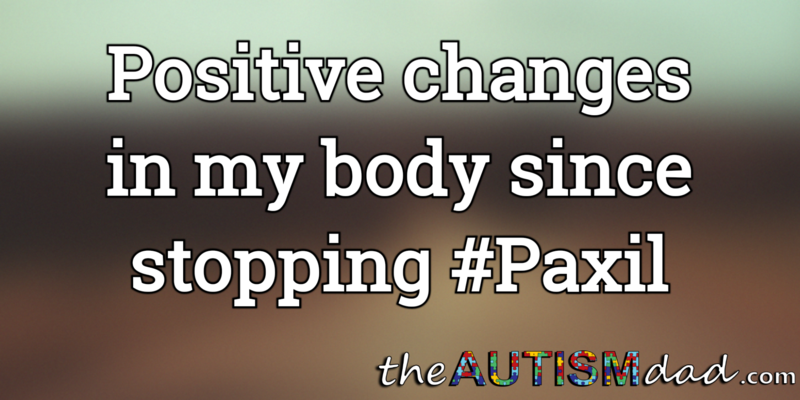 The biggest thing right now for me is dealing with how not having the Paxil in my system is influencing pretty much every aspect of my life. I was opening myself up because even if you aren’t an Autism or Special Needs parent, most people can relate on a human level. The very first comment I read was from Dutch and rather than thinking, “maybe nows not the best time to share my opinion on how he wrote this post or how he could do it better” he just puts his criticism down because for some unknown reason, he values him own opinion so much, that he can’t keep them to himself. It’s not helpful and in all honesty, it’s hurtful. Nothing I say or do is ever going to educate Dutch because nothing I’ve already said or done has. I feel like he wants this to be written his way. Whatever though. It truly doesn’t matter. All I can do is be true to myself and help those I know I can help. I mentioned taxpayer because as someone who pays taxes, I am literally financing the life of your family and others like you. Because of that, I feel like you have such an opportunity to educate people like me (and Dutch) who might be ignorant of what those tax dollars are going towards. So many people (myself included) can judge or look down upon those who appear to be able-bodied yet are on welfare. I don’t know Dutch’s situation; he may be working 4 jobs to make ends meet or he may be living in the attic with Chuck Cunningham, but he does at times offer helpful advice. You like to call yourself a fixer, maybe he is too and he is offering that advice from a good place. I have offered advice on many occasions and for me, it comes from a place of “maybe he hasn’t thought of this” or “can’t hurt to try”. It’s just who I am. Maybe it’s who Dutch is too. I guess I’m not willing to write him off as overly critical just yet. What you don’t seem to understand is that I’m not asking for your advice or how I could better help you, because that’s what it sees to come down to. I write what I want, when I need to and that’s it. It either helps you or it doesn’t. I don’t need nor do I want your critique on everything. I poured my heart and soul out in this post and rather than show some humanity, you decide to critique it. Who do you think you are? People who are in similar shoes to my own, read my words and either realize or are reminded that they aren’t alone. They aren’t the only ones feeling these things. That’s why I share the way I do.